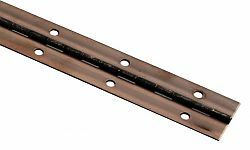 Continuous piano hinges are some of the most versatile and cost-effective hinges in the market and can be customized to fit your needs. These continuous piano hinges work well on bench style seats, lids, table leaves, or toy boxes. Hinges can be cut down in the field to size if your job requires a shorter length. Use with #5 Flat Head Wood Screws (sold separately). 2in. hole spacing with countersunk screw holes (24 holes total). PLEASE NOTE: These hinges can vary in finish from antique copper to antique bronze. Pin Diameter - .09 in. Hole Spacing: 2in. hole spacing with countersunk screw holes (24 holes total).